Engaged or newlywed in Massachusetts? If you’re considering changing your name after marriage, we’ve got the full scoop for you. The first place to change your name is with the Social Security Administration. You will need to complete the SS-5 form and file it by mail or in-person with your certified marriage certificate and photo ID. Your social security number will not change, but a new card will be issued in your new married name. This card will arrive by mail approximately two weeks after you file the SS-5 form. Next up is notifying the IRS of your new married name. Complete the IRS 8822 form and mail it to the appropriate IRS office address listed on the second page of the form (which is based on your state of residence.) Please note that the IRS offices do not have street addresses. You simply mail to the abbreviated address listed on the form. Filing the IRS 8822 form is free, and ensures that when tax time arrives the IRS knows who you are, what your married name is, and where to send your tax returns. The last federal office to update your name with is the State Department. Select the appropriate passport form to complete based on your current passport status. You will need to submit your current U.S. passport when you file, so be cognizant of any up-coming international trips. The State Department is taking approximately 5 weeks to issue new passports. If you need yours faster, you can pay an additional fee to have your passport processing expedited. In Massachusetts, you must file for your new driver’s license with your new Social Security card showing your new married name. This is why filing the SS-5 form is at the beginning of our list! Along with your new Social Security card, you will also need to bring your completed driver’s license application form, certified marriage certificate, current state driver’s license or photo ID, proof of residence (ex: utility bill, paycheck) if your address has changed, and $25 for the application fee. Your new Massachusetts driver’s license will be issued the same day you file for it. Once you’ve filed all of your federal and state-level name change forms, you will need to notify all of your banks, credit cards, insurances, medical providers, employers, insurance providers, mortgage providers, membership companies, magazines, etc. Basically any company that sends you anything by mail, or bills you in your maiden name will need to be notified of your new married name. The notifications can be done by phone, mail, or fax (yes fax machines still exist) depending on the entity you are contacting. 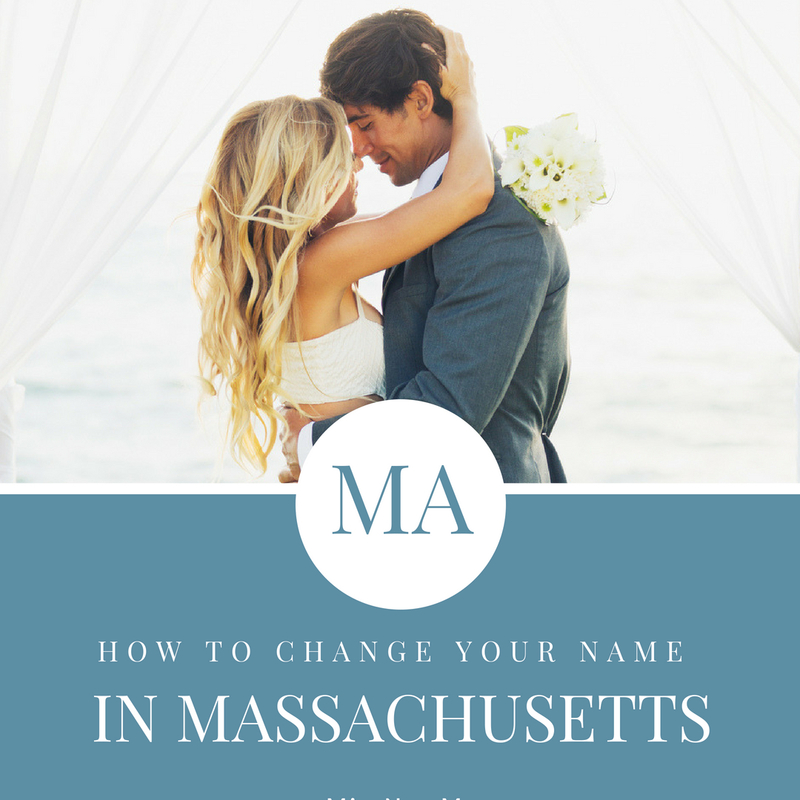 If all of the in’s and out’s of the married name change process in Massachusetts seems daunting, don’t worry. The MissNowMrs easy online name change service was created to streamline the tedious 13 hour process into 30 minutes! Sign up, answer a few questions, and all of your name change forms will be auto-completed for you. It’s like pressing the easy button for married name change!